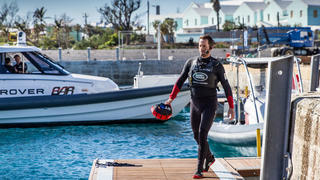 I imagine the other America’s Cup teams were keen to check us out on arrival in Bermuda — just as, for our team, it was a big moment in the campaign to start lining up against some of our opposition. The race course here has very flat water and is perfect for foiling. It’s also pretty small but we’re used to that, coming from the Solent. It’ll be no surprise that our first few months on the island have been incredibly busy. We moved our sailing operations to Bermuda in early December and since then we have juggled the practical aspects of the move — completing our new base and getting operational — with the need to get out on the water and keep developing our boats and our skills as a race team. The transition period is behind us, though, and we’re settling into the hard work before the racing starts. Georgie, our daughter Bellatrix and I live on the Isle of Wight at home so island life isn’t new to us, although there are a few rules here that are quite different. The biggest thing is transport — there are no rental cars on Bermuda and, although we’ve got a special dispensation for our Land Rovers, there are only a handful of vehicles for the whole team. So we’ve had to find other ways of getting about. Often, using the water is easiest as the island’s roads are narrow and winding — and taking a boat to work is no hardship in such a beautiful place. If you have a bit more time, then cycling is a great way to travel and it certainly helps with aerobic fitness. We’ve been too busy for much socialising but we did attend a wonderful reception at Government House just after we arrived. And the Hamilton Princess hotel is proving to be a great venue — it’s where a lot of the team are staying. Meanwhile, the new chef at our sailing base here is doing a terrific job, which is good because we’re having to work long hours and eating a lot of meals there. Although we won’t be here for that long, we felt it was important that we left a legacy in Bermuda. 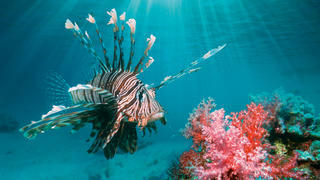 We’ve got a lot of projects running to achieve that and one of the most interesting concerns the lionfish. They belong in the Indian and Pacific oceans but were released, either accidentally or deliberately, into the Atlantic in the 1980s. They now pose a threat to the natural order in the Eastern US, Caribbean Sea, Gulf of Mexico and Bermuda. They feed on 70 species of fish and crustaceans but, with 18 poisonous spines, they have few natural predators. The Atlantic fish don’t see them as a threat so they can decimate local fish populations terrifyingly quickly. The Bermuda Lionfish Task Force holds daily dives to find and cull them but, since lionfish hunt at depths of up to 300 metres, new methods are needed to arrest the damage they are doing to Bermuda. With our sustainability partner, 11th Hour Racing, we are looking at ways we can help. 11th Hour Racing is also funding the Bermuda Exploration Zone at our team base to engage the public on ocean health and environmental issues, such as the lionfish, and we will leave this resource behind for the benefit of the island. We’re also leaving behind the 62kW solar PV wall that our renewable energy partner, Low Carbon, worked with a local supplier to install at the National Museum of Bermuda. It will save them 28 tonnes of CO2 a year and provide a sustainable energy source long into the future. Although we plan to take the Cup home, we will be leaving a lot behind that’s worthwhile.